This post was originally posted by Jesica at runladylike.com on January 4, 2013. You can view the original article by visiting the website. You can also follow Jesica at @runladylike on Twitter. Happy first Friday of 2013! Here at runladylike.com, Fridays are all about sharing the inspiring stories of fit people who motivate all of us to be better tomorrow than we were yesterday. My Friday FITspiration series profiles runners, triathletes and casual exercisers who are making choices every day to be as healthy as they can be – in both huge ways and through simple, small victories. Their stories are about the journey of transforming from ordinary to extraordinary each and every day. To kick off the New Year, I’d like you to meet Matt Orlando from The Runner Dad. Matt was born and raised in New Jersey and is a new dad to a 4-month-old baby boy. His recent claim to fame was winning the 2012 #RunChat award for having the best new blog, voted on by the online running community. 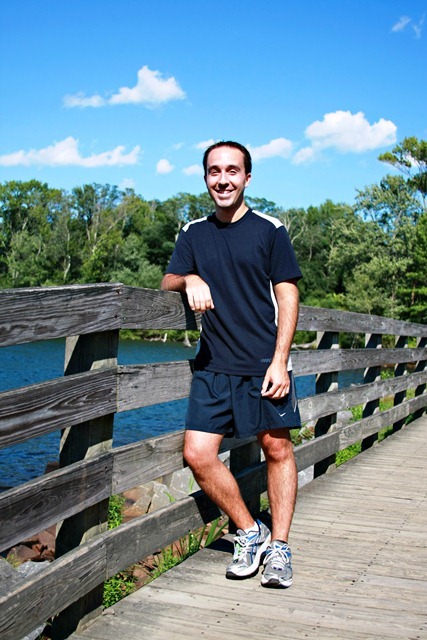 Matt has been running since he was in high school and has an amazing story to share. How long have you been running, and what inspired you to start? I started running back in high school in 1995. A friend of mine convinced me to give cross country a try, and I never looked back. It’s been quite a journey. Finish this sentence: I run because _______________________. My main reason for running right now is my little man. I want to be fit and healthy for him so I’m there for every special moment, every birthday, every high and low. And, of course, I need to stay faster than him for as long as possible! What is your favorite race distance? Why? If you’re comfortable, brag about your race PRs. I’d have to say my favorite race distance is the half marathon. Up until a few years ago, I had only run 5Ks. But once I ran the half my whole perspective on running changed. After my first half, I trained for and ran the Walt Disney World Marathon. I quickly determined the full marathon distance wasn’t for me. I love the half, and my current PR is 1:50. What running/racing accomplishment are you most proud of? I’d love to keep trading off the fact that I ran a 4:57 mile in high school … but those days are long behind me. So I’m currently very proud of my 1:50 PR in the half. What goal do you most want to accomplish in 2013? My main running goal is to run a sub-1:50 half marathon. I have it planned for the same race I ran my current PR at, so hopefully good things will happen. What is the hardest challenge you have had to overcome? How did you do it? The hardest running-related challenge I’ve had to overcome was during the past 2 years when I had a 1.5-hour commute each way to work. It basically took the drive right out of me. My long commute, coupled with some injuries that took me out for months at a time, caused me to not run for almost 14 months. I finally realized how much of an effect it was having on my running and personal life and finally did something about it. I have a new job with only an 8-minute commute each way, and things are so much better both running wise and family wise. I even get to come home to see my wife and son at lunch! What advice would you give to someone who wants to start running or who thinks they can’t do it? Everyone can run. Whether you run a 4-minute mile or a 15-minute mile, all it takes is a pair of shoes and the desire to get out the door. Being a runner isn’t about speed or skill. Being a runner is a mindset. Being a runner is about taking one step, then another, then another … enjoying the easy runs, gutting out the hard runs and just enjoying the journey along the way. What is your running mantra(s)? Find the reason. Find the courage. Find the strength. What running gear do you never run without? I’m honestly not tied to anything in particular. Even shoes are optional when the surface permits it. When I lived near the beach, I would run for miles barefoot on the sand and boardwalk. If I had to pick something, though, I’d say my Garmin Forerunner 205. It really helps me focus my training efforts. What keeps you hydrated and fueled the best (us runners are always looking for the best tips and secrets on nutrition!)? I used to be strictly a Gatorade man, but now I primarily drink Powerade on runs. I find Gatorade to be a bit thicker (if that’s the right word) than Powerade, plus I like some of Powerade’s flavors better. I typically use PowerGel for fuel, although I’ll mix in Jelly Belly Sports Beans during longer runs to mix it up. 99% of the time I don’t run with music. I prefer the sounds of the environment and my own breathing to keep me company. On the rare occasion I do listen to music while running, it’s usually the local Christian radio station Star 99.1 NY. Are you a morning or an evening runner? If you’re a morning person, what’s your secret to not hitting snooze? I wish I was a morning runner! For me to fit in a morning run means getting up at 5 a.m. That’s definitely not happening. So, my weekday runs all take place after work, and my weekend long runs vary from first thing in the morning if I have the time or later in the afternoon. What is one thing most people would be surprised to know about you? Everyone is always surprised to find out that I don’t drink alcohol, nor have I ever had a drink in my life. I’m not against other people drinking; it’s just not something I ever desired to do. What are your favorite running blogs or Web sites? We heard you were just awarded the #RunChat new blogger of the year. What’s the most important thing you took away from blogging in 2012, and what #1 tip would you recommend to other running bloggers out there? The most important thing I took away from blogging in 2012 (in just 3 short months) is to just be honest and write from the heart. Just be who you are, and share what you think others would enjoy reading. My #1 tip to other running bloggers is this: Don’t just write about what your training is like. We can read that anywhere. Let us into your lives, share your passions and people will definitely come back for more. Thank you Matt for sharing your story with us! If you or someone you know would be a great candidate for Friday FITspiration, email me at runladylike@gmail.com. And in case you missed it, check out the 5 most FITspiring stories from 2012! #RunChat is a Twitter chat that’s held the second and fourth Sunday of every month at 8 p.m. EST and brings runners of all abilities from across the world to talk about all things running-related. To learn more, visit www.therunchat.com. Matt’s awesome running mantra is Find the reason. Find the courage. Find the strength. Where do you find your reason, courage and strength to run? I loved reading this again, Matt! It never gets old reading inspiring stories, experiences and goals from other runners. Thank you again for allowing me to profile you and for sharing this again for others to see. We all have something to learn from each other! Happy running and have a great weekend!